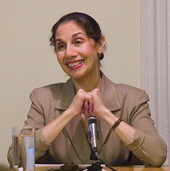 ELLEN REISS is Aesthetic Realism Chairman of Education, appointed by Eli Siegel. She teaches the professional classes for Aesthetic Realism Consultants and Associates. A poet and critic, she also teaches the course “The Aesthetic Realism Explanation of Poetry” at the Foundation. Prior to becoming Chairman in 1977, she taught in the English departments of Hunter College and Queens College of the City University of New York. She is Editor of the periodical The Right of Aesthetic Realism to Be Known, and her commentaries there, on world events, literature, history, and the human self, have been educating people worldwide. She is considered by many people the foremost educator in the world today. What Is Loyalty to America? The Sanity of Poetry; or, H.D.